Care for braces begins the moment that the brackets have been attached whether partially or completely. In fact, you would need to be careful for the next six months up to two years. 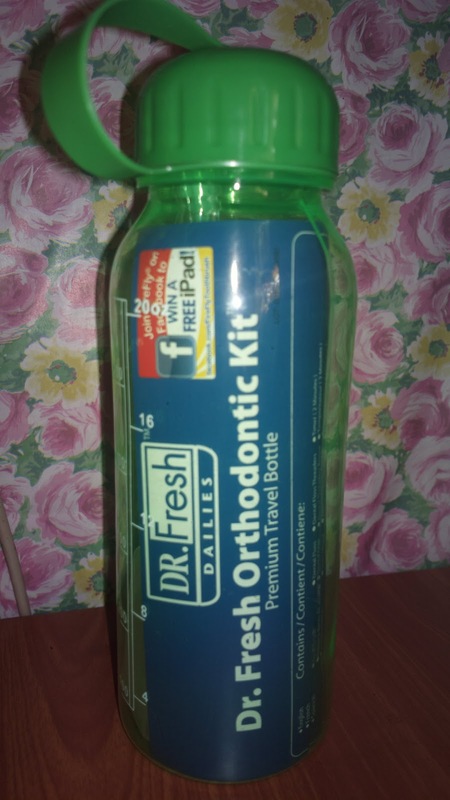 So in this post, I’ll list down some of the things you can do and items you can use in order to take care of your braces. 1. Gargle or brush. It’s always recommended to brush your teeth soon after eating so food crumbs don’t get stuck in between the braces for too long. When brushing, be extra careful as you might actually break the brackets due to a heavy brushing motion. If brushing is not possible, you can gargle with water. The latter had been a habit of mine for quite some time now especially when I dine out or simply hang out in malls. I can attest to the fact that it works after seeing bits and scraps of food being washed away in comfort room washer sinks when I gargle. Gargling with a mouthwash is of course even better. 2. Avoid specific types of food. This is most crucial especially during the first few days after the brackets have been attached. Your dentist will recommend for you to avoid eating specific types of food which may cause the brackets to be loose or broken. Some of such food groups include those which stick on the braces including meat as well as those which are brittle or hard like chips. 3. Watch your sleeping position. I’ve found that sleeping on your sides may accidentally break the brackets. I broke one of mine when it was only partially attached at the front area because I needed to wait for my gums (2 wisdom teeth pulled out) to heal (and it took over a month!) before the rest was attached. I was dreaming and clenched my teeth in anger. I woke up with one broken bracket. Sleeping on any of your sides may have it worst so it’s best to sleep upright whenever you can. 4. Always bring a travel toothbrush. In relation to tip number one, of course you would need the actual toothbrush. It’s not going to be a problem at home but when outside, it’s something you should always bring. As for the toothpaste, it’s easy to borrow or purchase one so it’s not much of an issue. 5. Ask or buy a mint wax from your dentist or any dental supply pharmacy. This was very handy for me when the brackets were not fully connected yet. The wires at the end were protruding so they’re causing mouth sores. Placing a minimal amount of wax over the wires which are sticking out is a relief. 6. Use a proxy brush. This is quite similar to brush used for children’s feeding bottles but it’s smaller. It’s used to remove food which are stuck in between the braces that brushing is unable to remove. 7. Purchase a dental kit. This is not necessary but is recommended. I accidentally got one when I was looking for a mint wax because the free box given to me was already consumed. Talk about a full month of partially attached brackets with wires sticking out, that’s why! 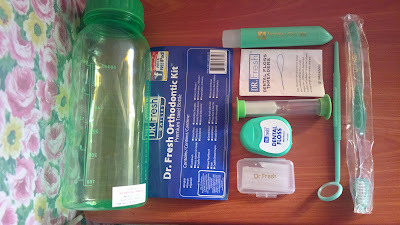 A local dentist from a different dental clinic offered me an actual kit which consists of an entire set which anyone with braces can take advantage of. 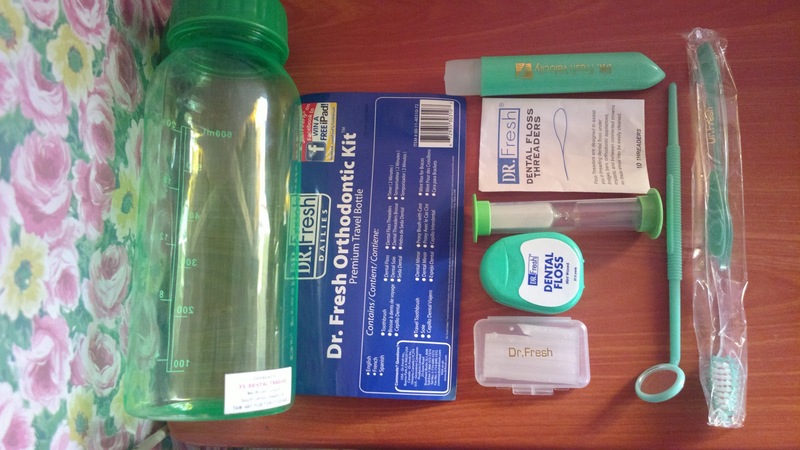 The items added in the kit include a toothbrush, travel toothbrush, dental mirror, dental floss, dental threaders, timer, proxy brush with case, and mint wax kept inside a bottle with cap. 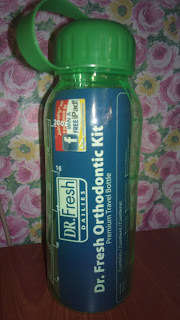 You can ask a dental clinic or any dental supply store for this kit. It’s very important to take of your teeth and braces during the entire duration that you wear them; otherwise, you’d end up with more damaged teeth afterwards. This is the reason why most dentists would deal with other issues first before actually attaching braces such as cleaning the entire teeth, cementing damaged and darkened teeth (8 of mine below was fixed first with 8 more above are next in line =), pulling out decayed tooth which can no longer be fixed (like my 2 wisdom teeth), requesting for dental x-rays to reveal your teeth structure, and so on. But if you are currently wearing braces or are planning to do so, the 7 ways to care for braces listed above will definitely help you.